Everyone has a story. These are some of ours. Meena was forced into an abusive marriage at a young age, and when she was just 16, desperation drove her to attempt suicide. Meena survived, but she endured extensive burns to her entire body and an excruciating recovery. Meena began working as a stitcher for one of our partner businesses, and her joy and laughter around the office are infectious. Her experiences have given her incredible compassion for others, and she is a natural nurturer. Meena’s scars were causing her daily pain and interfering with her work, but on the fourth anniversary of her accident, we received a donation for the full amount needed to pay for corrective surgery! She has undergone several surgeries to repair her face, lips, and neck to alleviate her pain. Meena recently remarried and continues to thrive personally and professionally. Roshan was one of the very first block printers to be hired by our partner business in northern India. The business owner had seen him begging on the streets, holding his little can out for money, and she was so shocked by him—she thought his bright eyes promised a better future. Roshan received job training, and soon our partner business hired him as a block printer. Roshan worked hard and flourished in his new role, always going the extra mile to please. Soon he became the leader of the entire team of block printers. Culturally, it is unusual for people to esteem a young authority figure, but Roshan displays such excellence and integrity with his work that all of his fellow block printers—young and old—respect him. He pushes himself to learn new things every day. Shivani was completely dependent on an abusive husband and received no help from her family. She lived in constant fear of the outside world and in constant worry about her daughters and their future. Shivani’s world changed when she began to work for one of our partner businesses as a stitcher. Her job it makes her feel safe, gives her self-confidence, and encourages her to dream about advancing in the company. She now manages her household completely by herself and never has to worry about money. JoyCorps provides medical care for Shivani and her daughters and sends both girls to good schools. Her oldest daughter dreams of becoming a business accountant. Karma and Nyima grew up in poverty in the mountains of Tibet. Lured by the promise of work in India, they left their two-year-old son in the care of his grandparents with the idea that they’d come back for him once they were settled. They were unable to find jobs, yet without the proper paperwork, they were stuck in India and apart from their son for three years. Karma and Nyima finally found work at one of our partner businesses, Karma as a stitcher and Nyima as a block printer. We helped them obtain documentation so that Karma could finally return to Tibet for her son, Sonam. She walked for two weeks over the mountains, by foot, to be reunited with him. Sonam is now in school, and in 2015 the family welcomed a healthy daughter. Karma and Nyima are so happy to know that their children have a bright future. Born in Tibet, TP was just nine years old when he was sent away by his mother to work for another family. As with so many other children, TP’s difficult childhood led him to struggle with addiction. As a teenager he entered a rehab facility, where he first met Dave Murray, an American who taught him and some of the other men how to play the guitar. After TP left rehab, Dave offered him a job at Dehradun Guitar Company, where he found a supportive community of men who help one another stay clean. He also found purpose and discovered his skill for the intricate art of guitar craftsmanship. JoyCorps has helped TP gain legal documentation, so he no longer has to live in fear of exportation. He is now a happy husband and father and continues to build custom guitars for DGC. Only a year into her marriage, Dina’s husband suffered a stroke. With a four-month-old daughter, significant medical costs, and only part-time work, Dina was under tremendous stress. She lived in constant fear that the family would lose everything they owned. Dina began to work part-time as a stitcher for one of our partner businesses. She loved the community so much that she soon asked to work there full-time. Because of this, the family did not lose their house. Dina was able to apply for short-term rent support through JoyCorps until her husband found work. Dina sees her daughter’s future becoming bright. Dina herself had limited education in Bengali, but now she is fluent in Hindi and learning English through on-site English classes at work. Liberated from constant worry over her family’s immediate survival, Dina is now free to express her beautiful heart of compassion toward others. She is insistent that if anyone in the community has a need, she is there to help. Reena’s husband died on the day her third daughter was born. Newly widowed with three young girls, no home, and no work, Reena began to despair. Fortunately she got a job cooking and stitching for one of JoyCorps’ partner businesses in New Delhi. However, in order to work, she was forced to leave her girls home alone while she worked. JoyCorps helped Reena’s workplace add an onsite nursery and hire a nanny so that Reena would be able to take her daughters to work with her, where they would be safe and well cared for. 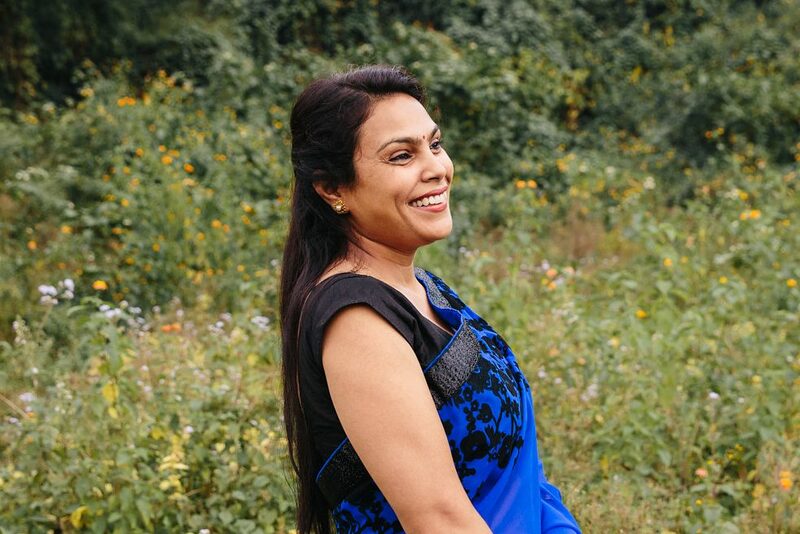 Reena applied for a housing subsidy from JoyCorps so that the family would have a suitable home, and she is also receiving help with tuition for costs for her two older girls. They are flourishing in their new school. We love seeing this family thrive! Beautiful Malti always has a smile on her face, even though she spent her youth on the street digging through trash to find bottles for money. But Malti is a hard worker who dreamed of more. At the age of 16, she began to receive job training from local nonprofit that JoyCorps partners with. Soon after, she landed a job as a stitcher for one of our partner businesses. Though surrounded by a sea of peers who had chosen lives of begging, Malti never gave in. She is so joyful and looks perpetually young, so no one would guess that she is the main breadwinner for her household. She works a full-time job and then goes home to care for three siblings. After eight months working full-time, Malti couldn’t wait to approach the local community board with a request for a $200 micro loan. With this money she could finally secure a lawyer to help her recover land that was rightfully hers but had been taken by a family member. She got her land back! And now she and her sibling are off the streets—all because of $200. Within a few months, Malti had paid back her loan in full. She continues to work hard and thrive.